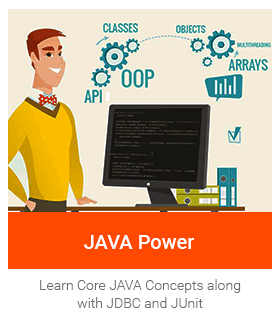 JAVA Power sets your career on high gear with 9 levels of Core Java programming. JAVA Power is a scenario-based online course packed with whiteboard videos, interactive quiz, online simulation programs, interview questions, best practices, methods to avoid errors and fun facts about JAVA. And if that’s not enough, the course also prepares you for Java SE 8 Programmer I 1Z0-808 Certification conducted by Oracle. We begin with What is Java, Features of Java, Concept and features of OOP, Development environment, JVM, Java Development Kit, JRE, IDE (Eclipse), JIT compiler, How to install, Running and testing first Java program and understanding programming flow. Then comes the basic building blocks of Java that is the variables, Types of variables (local, instance, static), data types, operators, Type casting, Modifiers and types, Classes, objects, methods, Cloning objects, operators, parameters, arguments and adding comments. We writing programs with decision making statements like if, if..else and switch…case, Loops like While, for and do..while. We learn how to use keywords break, continue and ‘this’. Using arrays and scanner class in Java programs. Learn the usage of Strings, String literal, string objects, string classes, String class function, Stringbuilder class and its methods, Stringbuffer class and its methods. A lesson on collections framework, Iterator interface, Set interface, classes and methods, List interface, its classes and methods, Stack class and methods, Queue interface and methods, Comparator interface and methods, Map interface, its classes and methods. Here, we learn most important concepts of Java such as meaning of inheritance, Subclasses and superclasses, polymorphism, method overloading, Method overriding, abstraction, encapsulation, type promotion, interface and constructors. Write bug-free Java code like multithreading, creating and executing threads, thread deadlock, synchronization, exception handling, Try, catch blocks, throw, throws and finally block. Connect Java applications with database using JDBC and API. Learn the detailed steps to connect Java application to a database with Statement interface, PreparedStatement, CallableStatement, ResultSet interface and navigating ResultSet. Learn connecting to Oracle and MySQL. We have a bonus level for you, where you learn to test your Java applications. You will study basic concepts of testing, methods of testing, levels of testing, Unit Testing, creating Unit test cases, introduction to JUnit and Assert methods.